Dave Seim is doing the daily maintenance on our three generators. AC for lights, DC for radios and a 440 generator for the FADAC computer, shown on my home page. The generators ran in excess of 12 hours per day so a supply of gasoline had to be available to feed them. They took tender loving care to keep in operation. Mortars and rockets could damage them so we protected them with sand. A direct hit or one close by was the main danger to them. Most small weapons could not penetrate the sandbags and boxes. Vince Stilla, Mr. Fix-It in FDC during my tour, was magic at getting the FADAC back in service. After he left we sent it to the rear, where repair specialists could not get parts. 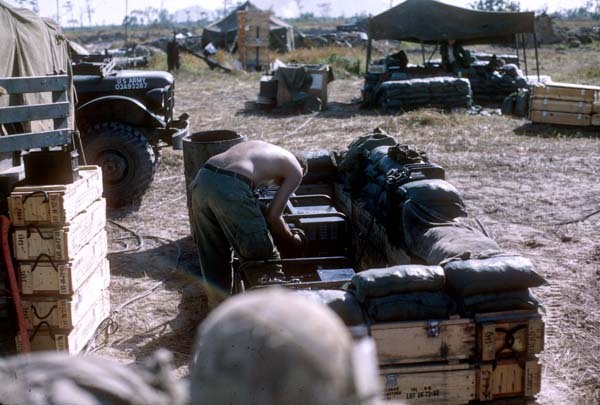 Because the generators ran so many hours per 24, it made FDC an acoustical aiming point for mortars or rockets shot at the firebase. Often we were saved because most enemy arms were not accurate. They had to shoot a few rounds and get, or be gotten, as our 105 battery was quick and accurate in returning fire. The land surrounding most of the area around firebases was flat as a table and clear of obstructions. It was likely their death to use mortars or rockets against us.